Last Sunday my wife, some friends, and I had the opportunity to help with the Help-Portrait Greenville. Wow! What an incredible experience! If you’re not familiar with what this is, it’s where a couple of photographers come together to take portraits for homeless people. I had no idea the response and the impact it would have on me. We did this at the Triune Mercy Center, which is a church that exists to serve the homeless people of downtown Greenville SC. I want to share 5 things I believe we can learn from the homeless. 1. Don’t take anything for granted – We met a man who had a 3 week old baby in his arms. He said this was the first and only picture of his baby. Based on his situation, it may be the only one he’ll have for a long time. Since having our first child a year ago, we have over 4,000 pictures of him on iPhoto! 2. A better understanding of redemption – This same man with his 3 week old baby told me that God replaced the drug addiction in his life with this child. I said, “it’s a much better trade off”. He responds, “but salvation is the best part!”. For some reason we let our pride tell us that we were never as bad as certain people were. Ephesians tells us we were all dead in our sin. Dead. Not sick, wounded, or in critical condition. This man had a clear picture and understanding of what Christ had done for him. 3. What’s really important – We met another couple who was engaged and the woman was pregnant……and they lived under a bridge! My wife and I discussed, debated, and even argued over things like what color to paint the babies room, what kind of stroller we would have, and as my friend Cole said, “which booger bulb we would use.” Here is a couple that is not even certain if their child can be fed, sheltered from the elements, or have clothes on it’s back. Wow, what a wake up call! 4. 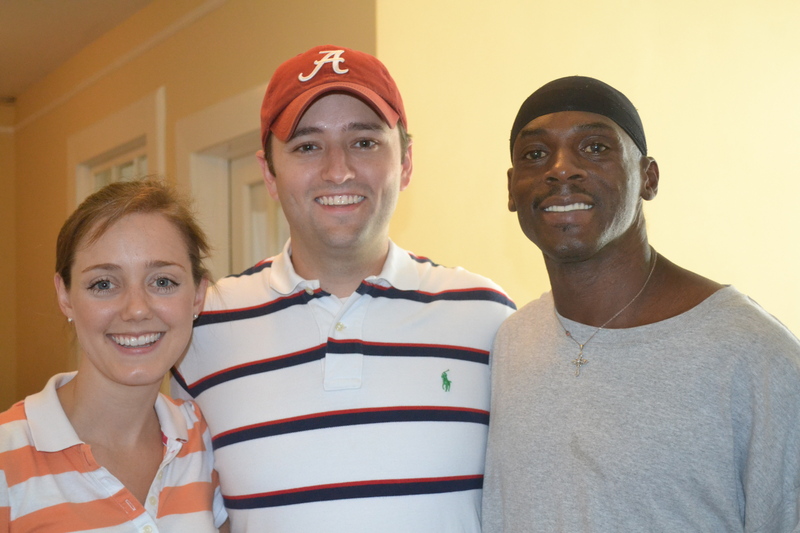 No one is beyond redemption – My wife and I met a gentleman who calls himself Ray Ray (see photo). Ray Ray had just finished serving 13 years in the state penitentiary. He had spent his life on the streets, using drugs, and making poor decisions. In fact, he almost died 3 times including once when his throat was cut. Now, he says his life has changed and he has left drugs only by the grace of God. Ray Ray is now determined to stay clean, follow Christ, and get back on his feet. As Paul tells us in Romans 8, nothing can separate us from the love of God. We are never beyond God’s grace and redemption. 5. Why the church exists – On our way out of Triune Mercy Center, my wife noticed that there were various tracts in a box by the door. This was a familiar scene as we have been members at and visited churches with a tract rack. However, these tracts were for cocaine and heroine addiction, dealing with suffering, and other real life problems. The tracts we were used to seeing were argumentative tracts about the doctrine we believed in. It hit us both in that moment how the church exists to glorify God and serve the community. However, most churches we know feel their reason for existence is to police doctrine. It reminded me of one of my favorite quotes; “the church should be a hospital for sinners, not a hotel for saints”. What a blessing this event and ministry was to us! It was more clear than ever to me why God has such a heart for the poor and outcasted. May we all learn to have that same heart. This entry was posted in Encouragement, Service.